Do you feel tired and overwhelmed almost every day? Did you forget how it feels to be relaxed, happy and excited for the future? In today’s society, tight schedules are a part of everyone’s lives. Therefore, it may seem impossible to fit in time to take care of our health. At some point, we might just tell ourselves “That’s just the way it is…”. There is, however, a method which allows you to pursue your career, spend time with your family and take care of yourself at the same time. Moreover, it is much simpler than you think! The secret lies in developing long-term healthy habits. Yes, that’s all! And this book it going to show you exactly how. The strategies are easy to follow and you can start implementing them today! 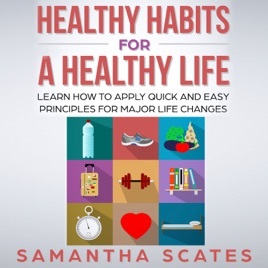 Although we might find it difficult to change our old habits, this book offers quick and easy steps with big impacts on your life. You will find condensed information without all the nonsense and confusion. With only a few minutes a day, you can change your life and see real benefits sooner than you think. Order now! Stop wasting any more time and begin your journey towards health and happiness!